Suave, handsome, charming and a truly multi-faceted personality, Patwant Singh was the polished face of the Sikhs in the later decades of his life. He had, by that time, already earned a formidable reputation by writing on international affairs, the environment, the arts, and as a TV and radio commentator as well as a magazine editor. Patwant Singh was born in New Delhi on March 28, 1925. He was educated in Delhi, after which he worked on construction sites. An urge to communicate his thoughts, and influence things around him, led to his becoming the publisher of the periodical The Indian Builder, in 1953, with which he started a career in writing and publishing. He was always immaculately turned out and loved the good things of life. His house, in one of the nicest areas of Lytton’s Delhi, was very well appointed, full of books on literature and art, and it was a delight to hear him speak impeccable English. No wonder, he was much in demand as an orator. He lived with his wife, Meher Dilshaw. Design, multidisciplinary journal edited and published by him, was a trailblazer when it came out in 1957. He wrote in various Indian newspapers, and his views were also published in the US’s New York Times, Canada’s Globe and Mail and the UK’s Independent. His first book, India and the Future of Asia (1967), had the 1962 Sino-Indian War as a backdrop. The Struggle for Power in Asia (1971) sought to counter the biased Western perceptions. Patwant Singh was the main person responsible for building Kabliji Hospital and the Rural Health Centre, near Gurgaon. He had a heart attack in 1977, but resumed normal life soon after. 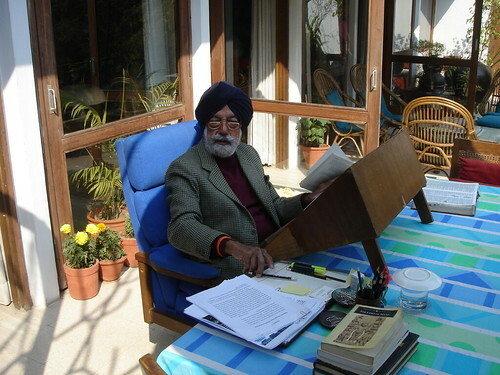 It was after 1984 that he wrote on matters concerning the Sikhs and wrote the main article for the book Punjab: The Fatal Miscalculation (1985). The famous volume The Golden Temple (1989) was followed by Of Dreams and Demons (1994), a memoir. The Sikhs (1999). Garland Around My Neck: The Story of Puran Singh of Pingalwara was co-written with Harinder Kaur Sekhon. In The World According to Washington: An Asian View (2005), he returned to the relationship of the West with Asia as a whole. Last year, he co-authored Empire of The Sikhs: The Life and Times of Maharaja Ranjit Singh, with Jyoti M Rai. With Patwant Singh’s death at the age of 84 on Saturday, an aesthete presence has left No. 11, Amrita Shergil Marg, New Delhi. Patwant Singh left an elegant mark on the world around him.